I got mine yesterday evening prior to a release event we held in Tel Aviv. I must admit that they felt very responsive yet cushioned enough to hold long runs. In comparison to other models the upper material seems to be a little tighter, which I found pretty nice. Will update once I try them on a warm day. Hopefully they won’t heat up too much during my long runs. I’ve had mine for a week now. Done 4 runs and a track workout in them. So far I love them. Great cushioning, super responsive and fit really well. The upper is ok, but not as locked in as I would prefer. I think I will stick to using them for long runs and possibly tempos as they do feel a bit more bulky than I am used to. This is my first pair of Boost and I would highly recommend them to anyone on the fence. Now what are the main differences between the new Solar Boost and the New Solar Glide by adidas? I know the Solar Glide is the new version of the Supernova. Just trying to decide to get one of the two. Anyone try out the Jordan Tenacity yet? As someone who struggles finding the right shoes due to relatively wide and very flat feet, I’ve had to experiment a decent amount. I’ve experienced a few minor to moderate lower leg injuries running in neutral shoes even with orthotic inserts. For general mileage use I’ve generally been running in neutral Saucony shoes and I’ve done tempo and speed work in Nike flats, namely the streak 6/Flyknit streak and streak lt 3. Recently I’ve moved to the Saucony Guide ISO, which has slightly more support than a neutral shoes and it seems to be working well. However, I haven’t quite found a new alternative that meets my needs for tempo and speed work. I’m wondering if anyone has any suggestions. I’m considering the Adidas Adios 3. It’s neutral but Adidas tend to run wider and it appears to have a little more to it than the Nike streak models. Any thoughts? Saucony Fast Twitch. You already seem to like their trainers and it’s a 10K-marathon racing flat with medial posting. Alternatively, in no particular order: New Balance 1500, Adidas Tempo, Brooks Asteria. i have very similar feet (very flat, very wide, but narrow toes – they look weird) and i use the skechers gorun forza 3 as my daily, saucony kinvara as my warmup/cooldown/recovery/fartlek kinda shoe, and for flats i use the skechers gomeb speed. i find it has what i want in a racing flat (light, snappy, nimble, low drop) while still having a decent amount of midsole to protect my feet. i used to love the streak lt2s for the same reason. lt3s beat my body up too much on anything but dirt and track. Anyone had a chance to try both the Solar Boost and Solar Glide? Differences? I LOVE the Solar Boost and have gotten two pairs already, but I’m curious if I can get a similar feel/ride out of the Glide and save $20 in the process. I HATED the Supernova however, so if those two are similar, it’s not gonna fly for me. The upper does not feel warm to me, and I’ve been training in central Kansas where it’s 75f with 90+% humidity at 6 AM. Secondly, I’ve had zero issues with any rubbing/irritating hot spots anywhere on the shoe. I absolutely love it and it’s everything a good Boost shoe should be. The upper is incredibly reminiscent of the OG Energy Boost, with the stretchy synthetic upper, but without the irritating plastic cage, instead opting for the knit weave upper. Love every mile in these. So thoughts on Pegasus Turbo? I’ve seen super mixed reviews pretty much everywhere. I really like the Pegasus 35 as a daily trainer. I’ve raced in the 4% and use the Zoom Fly for long runs or workouts. Peg Turbo is something I’d use on a long moderate run, a run with strides, or something around marathon pace. I don’t think it’s quick enough for intervals for me, but I really do like how light it is compared to the Peg 35. Worth the 180? I think so. Not as bouncy as 4% obviously, but it has its place. My issue is that I truly dislike the 35 and my feet don’t get along well with the Zoom Fly. The 35 is too light to be an everyday shoe for me and too unstable for me to want to use it for anything fast or moderate effort, so it doesn’t fit my rotation. I really want to like the Zoom Fly, but I think the stiffness causes my achilles / peroneus to flare up. So while it works well in my rotation, I can’t run in it because I’m worried about getting hurt. So I was hoping the Turbo would bridge the gap between the two other models. I know these are mostly ‘me’ issues, but I’m not wanting to drop $180 if the Turbo isn’t going to be exactly what I want it to be. I hit an approximate 700 km mark with my Solar boost and they are lasting nicely! The upper seems to be a little tight and since I was mainly running with them during the summer, they indeed felt warmer than regular. I’d like to point out that the weather over here is avg 80 degrees when I run. Blisters: when I laced too tight, immediately had a few blisters. At first I thought the shoe wore out but it semmed to be ok.after lacing a little loose. So, any difference between the Solar Boost and Solar Glide? I’m on my 3rd pair of Solar Boosts, and love them, but am wondering if I can save the $20 per pair and get the same performance from the Glide. I realize the upper is different, but any different ride or feel in the midsole? Only difference is in upper. Boost has a more premium knit upper, but ride wise they are exactly the same. Hey all, I’ve struggled with recurring Achilles tendinitis and was wondering if you guys had shoe recommendations? I am a neutral runner and have ran in many different brands and models over the years. 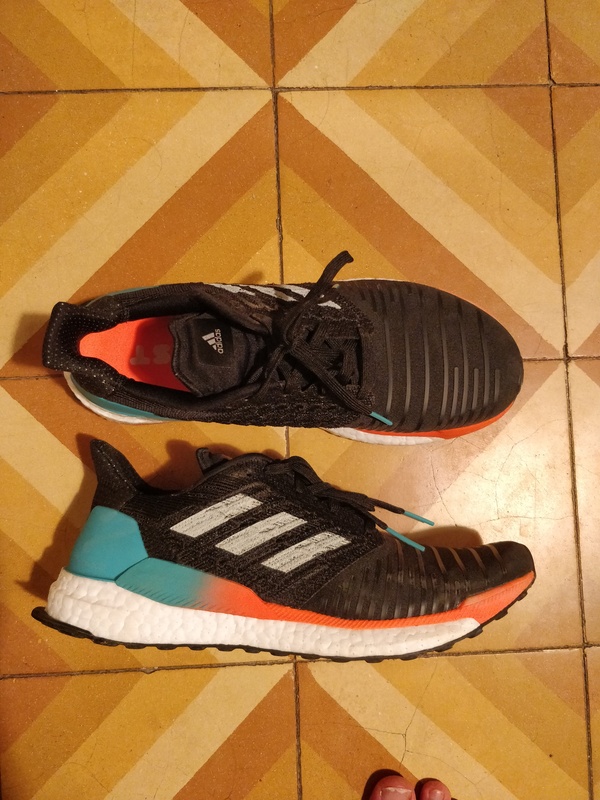 Was thinking about giving the OG energy boost a try, as I liked the supernova glide boost when it first came out, or perhaps the solar boost. I’ve also like doing my current peg turbos. Thanks in advance!